London Stock Exchange Group’s 1,000 Companies to Inspire Britain features a host of different types of companies – manufacturers, hoteliers, retailers, technology firms, printers and more besides. The entrepreneurs behind these businesses will each have their own stories about how they are achieving growth: the challenges overcome, opportunities created, moments of luck and periods of uncertainty. Because, building a business is never easy or straightforward, but it can be hugely rewarding. BGF, a start-up itself in 2011, has had its own hurdles to manage since we set out to create a major new growth capital investor to back and build British companies. Some people said that our model of investing wouldn’t work because Britain lacked true entrepreneurial talent and ambition; because UK business owners were averse to equity; and, more simply, there was no demand. I’d like to address these points in turn. Firstly, the past five years have seen an unprecedented growth in the number of new, registered companies and we have now surpassed the rate at which even the US creates start-ups. Ambition most definitely does exist here in Britain and, if we are to create an environment in which the next generation feel even more empowered to follow their entrepreneurial aspirations, that is something we must keep celebrating. Secondly, we knew we were taking a risk when BGF was founded but it was one we passionately believed in. We also knew that if we were determined and if we surrounded ourselves with people who believed, as passionately as we did, in championing British businesses, then we had a good chance of succeeding. Finally, as we celebrate our fifth anniversary, BGF has grown to eight offices and a team of 120 people across the UK, with 70 investors and support staff in HR, marketing, Information Technology and more. We have invested nearly £70m in over 100 companies and last year, we saw our first five successful scale-up exits. There is no doubt today about the demand for growth capital. And so, I could not be more proud to see BGF here in the 1,000 Companies list alongside so many businesses that we have invested in, met with and admire. Congratulations to every one of the 1,000 Companies to Inspire Britain. Congratulations on everything you have achieved over the past 12 months and I wish you all the very best for the future, which I am confident should be exciting for us all. Does your business need growth Capital? It is a question we ask business owners every day. Not everyone can answer it immediately. Let’s face it (and there is nothing to be ashamed of here), not everyone knows what we mean when we talk about growth capital. And that highlights a failing of the investment industry. Unconsciously, and sometimes consciously, over the years, investors have created a language and process for raising money that ends up alienating and excluding the very people that they want to attract. We want to break that mould. At its simplest, the growth capital we provide is long-term, patient (meaning no forced exit) equity funding that management teams use to execute their strategic plans. Businesses need to be adequately capitalised because not many lasting successes are built on debt alone. This is one of the most enduring lessons learned in recent years. Part of BGF’s role is to help companies find the optimal financial structure for their business, which sensibly weighs up risk, investment and timeframe against the strategic objectives laid out in a corporate plan. And we have done this 100 times over since we began investing in 2011. We have backed manufacturing companies, house builders, retailers, hoteliers, telecoms businesses – and plenty more besides. BGF makes initial investments usually between £2m and £10m and provides follow-on funding to support further growth. The money is used for a myriad of applications from buying new machinery, making acquisitions to diversifying into new areas. We offer companies a different type of funding option: long-term, patient capital in exchange for a minority stake. BGF’s funding provides an equity cushion, so that business owners can feel confident about taking the calculated risks. This might mean including an element of equity release in our investments, allowing business owners to derisk some of their personal financial commitments or concerns and focus on building their company. The feedback that we get from entrepreneurs and business owners suggests that our partnership approach and the sharing of expertise, guidance and contacts is often just as valuable to them as the capital that we inject into their businesses. For this reason, we created BGF’s Talent Network to develop relationships with a broad range of experienced board directors from across the corporate spectrum who can offer valued executive and non-executive support to the companies that we back. Their common link is a commitment to encourage and help great smaller and medium-sized businesses with ambitions to grow. By cultivating these relationships, we can give our investee companies unique access to expert and inspirational business leaders, which is unlikely to have been available to them before. To date, we have placed more than 80 highly experienced chairs and nonexecutives with investee companies and our Talent Network now constitutes one of the largest pools of non-executive capability in the UK. With capital and connections, comes confidence. There’s a lot to admire in entrepreneurs: they are the visionaries and the risk-takers and their success depends on having a robust support infrastructure. We want to encourage our investee companies to continue doing what they’re doing. And we’re delivering on that not just through financial backing, but by creating a network of entrepreneurs that matter; who are building the businesses that matter and the relationships that count. 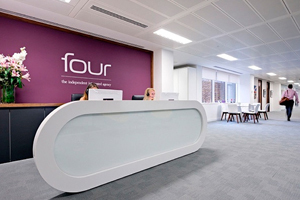 Four Communications is the UK’s sixth-largest independent communications agency with 200 staff working across its offices in London, Edinburgh, Abu Dhabi and Dubai. The business boasts a roster of 600 clients, which includes Etihad Airways, The Man Booker Prizes and Sotheby’s International Realty. Over the past four years, Four has acquired businesses that offer complementary services to the group. These include bgb, Colman Getty, Consolidated PR and MSA Media. In August 2015, BGF provided the business with a growth capital investment of £10m to support and accelerate its expansion. Four quickly put the capital to work, acquiring financial and professional services firm Broadgate Mainland and one of Wales’ leading agencies, FBA. The business also launched Four Consulting. Through BGF’s network of senior business leaders, it introduced Four’s management to John Farrell, former President and CEO of Publicis Groupe Specialised Agencies and Marketing Services. The team subsequently appointed John as its new chairman. 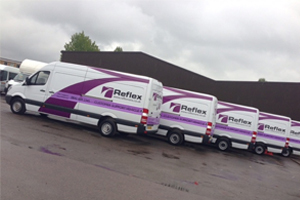 From its base in Loughborough in the East Midlands, Reflex operates a modern fleet of light-commercial hire vans used by businesses up and down the UK. The company provides its corporate customers – in sectors such as logistics, retail and security – with national, round-the-clock services and offers a range of duty of care products, marketed under the ‘Flexi’ brand. These include tracking systems, cameras and driver safety products. BGF invested £7.5m in the business in June 2015 to support the continued expansion of its fleet of light-commercial vehicles and fleet cars in conjunction with the provision of industry-leading customer service. The company currently has 4,000 vehicles in its fleet and aims to grow this to 10,000 over the next five years. Helping the business achieve its goal are non-Executive Directors Tony Trahar, former CEO of Anglo American, and Stewart Oades, former CEO of Christian Salvesen.